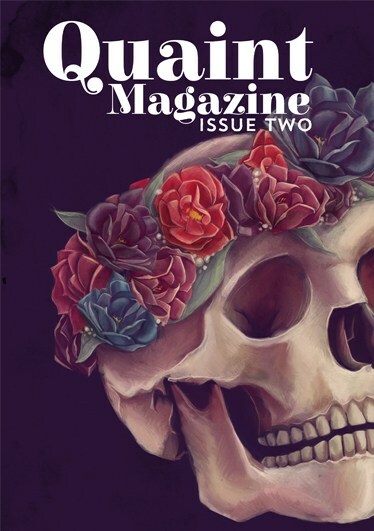 Quaint Magazine was a literary quarterly that published dynamic, arresting, and transgressive poetry, fiction, and creative non-fiction by female and gender non-binary writers. 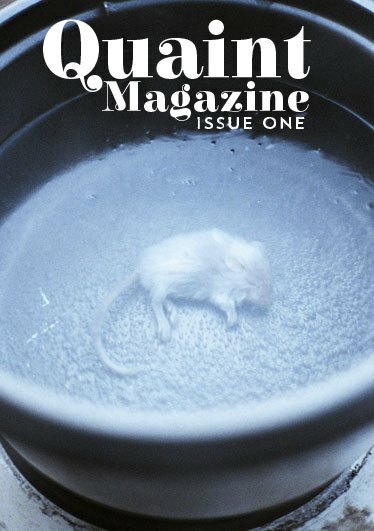 We were (and still are) strongly committed to publishing work from traditionally marginalized writers, giving voice to the strange, the weird, and the unsettling. Quaint Magazine was retired after six issues. With works by Sarah Askins, Vanessa Borjon, Portia Elan, Kat Finch, Caroline Goetze, Jean Ho, Kelly Jones, Mary King, Jill Kolongowski, M.E. Riley, Janice Sapigao, Karen Skolfield and Diana Valenzuela, this collection of works is provocative, daring, and not one tiny bit just “quaint”. 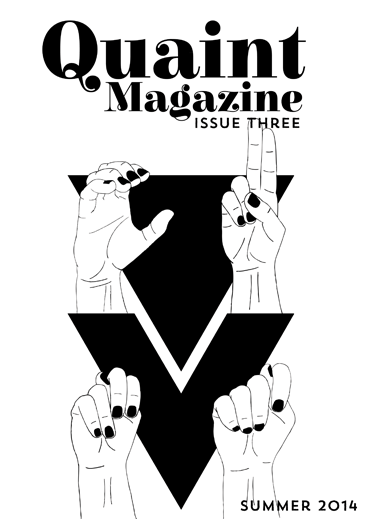 With works from Julie Brooks Barbour, Sarah Bridgins, Kori Hansell, Clare Harmon, iDrew, Maya Lowy, Leslie McGrath, Suzanne Wise, Eunsong Kim, Maggie Bàra, Alicia Thompson, Colleen Burner and Amarie Fox, this issue is brave, insightful and gutsy. With works by Kelly Harwood, Raquel Salas-Riveria, Julie Feng, Keira McKenzie, Clare Welsh, Kelsie Hahn, Hannah Baggott, Kathryn Jacobs, Katrina Carrasco, Jill Khoury, Red Durkin, Katy Collier, Alexis Rhone Fancher, Karissa Morton, Danielle Gillespie, Sarah Xerta, Elizabeth Schmuhl, Kate Litterer, Susan Cronin, Jade Hurter, Viola V, Chavisa Woods, Nikki Wallschlaeger, Amy Pence, Nicole Rollender, Allie Moreno, Alicia Catt, Emily O’Neill, and Rachel Chaperon, this bumper issue is our first available in print and on screen. Stephanie Doyle, Clare Harmon, Maya Lowy, Jen Hanks, Kailyn McCord, Alexandra Reisner. 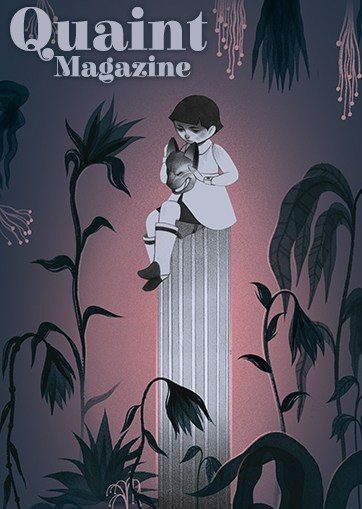 Featuring cover art by the phenomenal Inés Estrada, Quaint Issue 5 radiates and pulses with a unique, animalistic energy. With works by Nordette N. Adams, Sara Biggs Chaney, Sarah Boyle, Yu-Han Chao, Tessa Cheek, Tyrese Coleman, Juliet Cook, Isabelle Davis, Shelby Dale DeWeese, Amy Fant, Luiza Flynn-Goodlett, Deanne Gertner, Naadeyah Haseeb, Jessie Janeshek, H Kapp-Klote, Elizabeth Kohler, Olivia Olson, Nichole Riggs, Elaina G. Smith, Lauren Thurman, Lydia Spitler, Michelle Lin, Anna Maxymiw, and Sonya Vatomsky, Issue 5 is a visceral, cut-throat, punch-in-the-gut celebration of what it means to be a real-deal human being. Stephanie Doyle, Clare Harmon, Jen Hanks, Alexandra Reisner, Eunsong Kim. With works by Jesse Rice-Evans, Emily Anne Hopkins, Torii Johnson, Lily Myers, Susannah Betts, Antonina Palisano, Tiffany Gibert, E. Kristin Anderson, Jennifer Bradpiece, Lisa Mangini, Minadora Macheret, Katie Kelleher, Myrrah Dubey, Phoebe Glick, Rachel Lewis, Sarah Sandman, Chachi Hauser, Ginger Ko, Elizabeth Caplice, Chelsea Harris, Danielle Perry, Jane Flett, S.C. Hennessey, Ruth Daniell, Anita Felicelli, Amanda Lowe, Sarah Broderick, Alana King, Jesse Turetsky, and a stunning cover by Rachel Suggs, The final issue of Quaint Magazine is truly a tour-de-force.